This is an illustrated table of Winter Themed Irregular verbs showing the different past tenses of each present tense verb – both the past simple and the past participle. On page 4 are the headers for the tables. 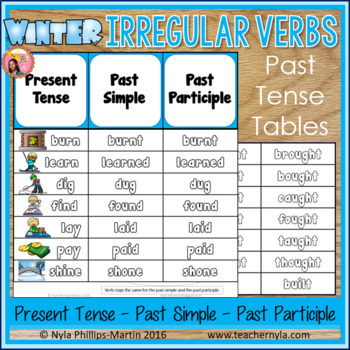 Each present tense verb has a matching picture to depict the word’s meaning. 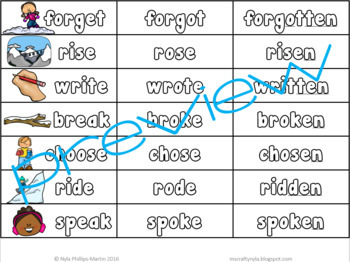 All of the verbs are grouped according to similarities in their past tense formations to make it easier for students to remember their spellings. 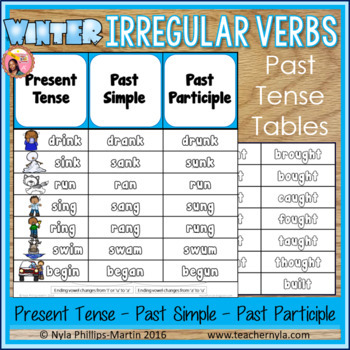 There are helpful descriptions at the bottom of each verb group to help students to remember the differences between each group. Each page prints on 8.5” x 11” (letter) sized paper. ❤️ I'd love for you to visit the Nyla's Crafty Teaching Blog! ❤️ Follow me on Pinterest!